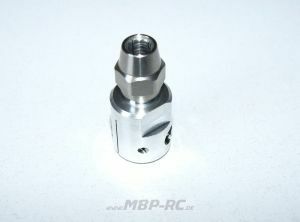 Made of aluminum, this coupler grips the motor shaft tightly and evenly around the entire diameter of the shaft. 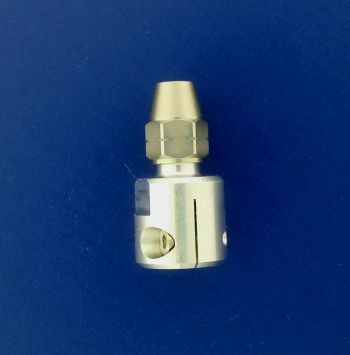 This caters for a loss-free transfer of the torque onto the coupler. On the flex cable side a collet style nut tightens down on the flex cable. Specs: 40mm long x 19mm diameter : Approx weight 27 grams. Specs: 44mm long x 22mm diameter : Approx weight 33 grams. 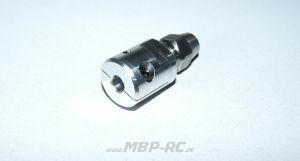 This can also be used with a motor that already has a flat spot on the shaft. The degree of the flattened surface must not exceed 15% of the shaft diameter.